Coffee from Ethical Bean Coffee company. 3 different choices, all of them Organic & 100% Arabica Fair Trade Certified whole bean, and roasted only in small batches. You have a dark roast Mexican Coffee, and a combo pack with 3 different blends. The Dark Roast can be purchased in a 3 pack of 12 ounce bags, or a 32 ounce bag. Your choice of a regular roast or a dark roast Mexican Coffee from Berres Brothers Coffee Roasters. Both are whole bean shipped as a 3 pack of 10 ounce bags. 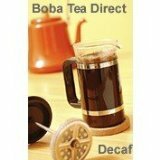 Several varieties of Mexican Coffees from Boba Tea Direct. All these blends are made from 100% Arabica premium beans that are high grown beans. You have the choice of whole bean decaf or regular, french press ground, and drip grind. Two different flavors to choose from: Liqueur & Cream Flavor, or a Spiced Cocoa. No matter which you choose, it will be fresh roasted the very day they are shipped to you and bagged in a heat sealed valve bag giving you the freshest coffee. Two different choices. 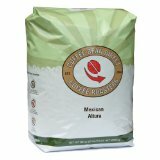 You have a 4 pacak of 12 ounce bags of ground Mexican SHG Custepec coffee, or a 4 pack of 12 ounce bags of whole bean Mexican SHG. Both are made with Kosher certified 100% Arabica ground coffee beans, Rainforest Alliance Certified. Coffee has a light acidity, with a nutty flavor and a clean, crips aftertaste. All of these Mexican coffee beans are freshly roasted in the United States. This is coffee from Discoveries, a whole bean Mexican Harvest coffee. It is a 4 pack of 24 ounce bags. Discoveries opened up in Victoria in 2006, and has since expanded to 2 more locations. There motto is to provide the best coffee they know how. Farmer's Daughters Coffee Company provides you with Decaf and Regular whole bean Mexican Coffee from Zaragoza that is single origin. This is 100% organic, shade-grown medium roast washed coffee that has a sweet, fruity and citrusy with notes of ripe cherries and semi-sweet chocolate. 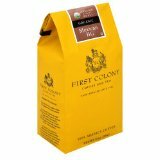 This is from First Colony and is packed in several different sizes, and a choice of whole bean or ground. It is certified organic Mexican coffee that is high grown in the Sierra Madre Mountains. Flavor is clean and bright with a delicate body and a lively acidity. This certified organic coffee is grown high in the Sierra Madre Mountains. It is clean and bright with lively acidity and delicate body. From Goya Coffee Company you get 2 choices of sizes. It can be bought as a 2 pack of 23 ounces each in a vacuum can, or you can purchase the 6 pack of 8.8 ounce units of decaf coffee. These are K-Cups which are for the Keurig Single Serve Brewers from Timothy's World Mexican Coffee. This is certified Organic and has a spicey, sweet and smoky flavor. You get several choices of Mexican Coffees from Coffee Bean Direct. All of these blends are roasted fresh immediately preceding being packaged. They have a fuller and more even flavor because they are slow roasted. The beans are al 100% Mexican Altura coffee beans. You choices include SWP Decaf whole bean in a 5 pound bag, SWP decaf 1 pound while bean, and a Green Mexican Altura 5 pounds whole bean. 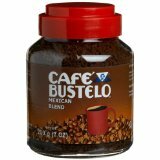 Café Bustelo Mexican Blend Instant coffee. This is a regular, not decaf, instant coffee that comes as a 4 pack of 7 ounce jars. 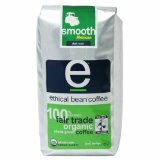 Schuil Fair Trade Certified Mexican La Selva whole bean organic coffee. It is packed in a 12 ounce bag. Coffee from Barrington Coffee Roasting Company. This is a french roast Mexican Chiapas Organic and Fair Trade whole bean coffee that is rich and seductive and packaged in a 12 ounce heat sealed foil bag that has a one-way valve seal to retain freshness. From Crop to Cup Coffee Company. Decaffeinated coffee that use the Mountain Water Process method of decaffeinating which is natural and chemical free. Naturally grown single source coffee that is grown in Chiapas on the border of Guatemala in the southernmost region of Mexico. Raised and sold by farmers, it is roasted and ground fresh. Flavor of sweet corn, dry finish, and caramel flavor. Comes packed in 10 ounce bags of whole beans or ground. Shade grown, Organic, origin coffee from Mexico. Boasts smooth, bright and lively characteristics with medium body, medium acidity, semi sweet, smooth, balanced, floral tones. This coffee is characterized by an intense aroma, a delicate body, and a middle acidity. Package of 20 espresso pods. 100% Arabica pods with a Mexican origin for E.S.E compatible espresso machines. These are not compatible with Senseo or Melitta style coffee pod machines. Very sweet with hints of hazelnut. A delicate, yet satisfying flavor. Fresh roasted to order. This is a medium roast Fair Trade coffee packed in a 1 pound bag. Three choices of Queen City Coffee brand coffee. 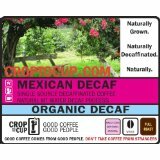 This is a whole bean Mexican Euro decaf coffee 3 pack of 8 ounce bags. Chiapian coffees are brighter, sweeter, with a definite clove spice to compliment the apricot fruit that is in the cup. Home roasting is easy, fun and produces the best coffee you have ever tasted. Great as a blender in espresso drinks. U-Roast-Em sells over 40 varieties of green coffee beans. Use these beans in a dedicated coffee roaster or roast in your oven on a cookie sheet. 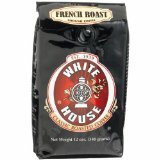 White House coffee brand of Organic Mexican ground or whole bean coffees. They come in a 3 pack of 12 ounce bags.